Tracey Cridge and Mark Unwin of Wellington were shocked to find their home had widespread water damage. They called in experts to look at what they thought was a little leak and discovered widespread internal water damage and an estimated repair bill and experts’ costs of around $250,000. Photo supplied. 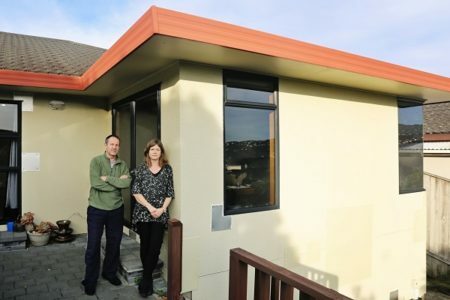 More leaky-building owners – many from the east Auckland – will have the chance to join a self-funded class action against James Hardie after the Court of Appeal released a judgment today upholding the representative action and extending opt-in periods from two and 10 weeks to five months. Costs have also been awarded in favour of the owners. 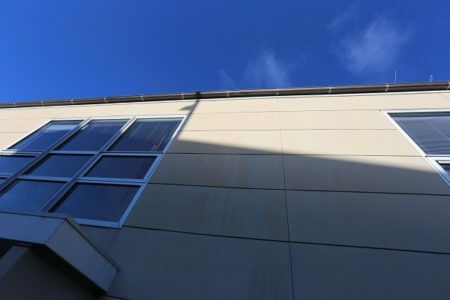 Leaky building owners represented by Wellington law firm Parker & Associates first brought a product liability claim against James Hardie New Zealand Limited and James Hardie Company Studorp Limited in negligence and for breach in the Fair Trading Act in 2015. Thousands of properties were built using Harditex from 1987 until the early 2000s and Titan Board was widely used from 1995. The Howick-Pakuranga area greatly expanded during this time, as many new residential subdivisions were developed. Titan Board was widely used from 1995. Photo supplied. The group’s lawyer, Dan Parker of Parker & Associates, told the Times it is aware there are many owners of properties clad in Harditex or Titan Board in the east Auckland region. Mr Parker urges owners of buildings constructed since 1987 using Harditex or Titan board to get in touch to find out how to opt in to join the claim. Experts can be arranged to investigate whether the materials in question have been used and whether damage has resulted. The owners allege that leaks in their homes are attributable to inherent defects in cladding systems manufactured by James Hardie. They also claim James Hardie made misleading statements about its cladding systems in its technical literature. It is alleged that a large number of home-owners may be affected. James Hardie denies its cladding systems are defective and will be defending all claims. James Hardie argued that the claims were not suitable for representative class action procedure. In December 2016, the High Court made orders allowing the case to proceed as representative action (class action) and granted an opt-in period of 10 weeks for Harditex and two weeks for the Titan Board class. In the judgment released today, the Court of Appeal has dismissed the appeal by James Hardie and upheld the High Court’s representative orders. The Court of Appeal also allowed a cross appeal by the plaintiff group owners and granted an opt-in period of five months for new class members to join the claim rather than the 10 weeks and two weeks period that had been granted by the High Court. Further, the Court of Appeal allowed the owners’ appeal against a judgment of Justice Susan Thomas in December 2015. The Court of Appeal concluded that Justice Thomas was wrong to decline to grant the declaratory orders sought at that time to preserve the position of members of the class for limitation purposes in the event that the court later declined to make a representative order. Costs have been awarded in favour of the owners. Mr Parker said the plaintiff group was very pleased with the judgment. Mr Parker said there had been strong interest from potential new claimants since the class action was given the go-ahead in October 2016. He anticipates that the group will increase significantly following the new opt-in orders, which take effect from August 30, 2017. Mr Parker said the group now looks forward to inviting other eligible class members to join the claim within the five-month opt-in period, which runs until the end of January 2018. “The opt-in period will be the last chance for most affected owners to pursue any legal action for recovery of their losses. If they join during the opt-in period, they will not be affected by a 15-year limitation longstop that will otherwise bar claims after the opt-in period expires. 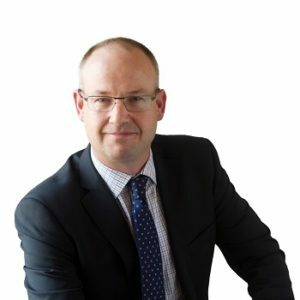 Also the Supreme Court confirmed last year in the leaky schools litigation that the 10 year Building Act limitation longstop does not apply to a product liability claim like this,” Mr Parker said. Thousands of properties were built using Harditex from 1987 until the early 2000s. Titan Board was widely used from 1995. Owners of properties clad in Harditex or Titan Board are invited to contact Parker & Associates urgently to find out how to opt-in. Parker & Associates is currently representing over 60 Harditex owners. There is currently only one property in the Titan Board class but there is significant interest from other owners of Harditex and Titan Board properties. Group members are pooling resources to pay for the class action, without the need for separate litigation funding. For further information contact Parker & Associates, 04 499 0390 or visit the website.